This elegant 18ct white gold ring is set with a sparkling princess cut diamond solitaire surrounded by smaller twinkling diamonds. It also features diamond-set shoulders for even more sparkle. 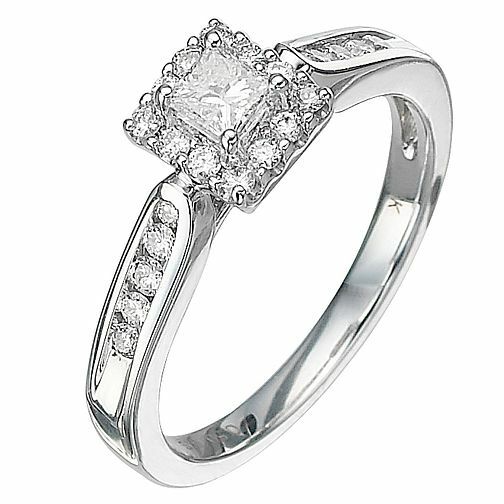 18ct White Gold Half Carat Princess Cut Diamond Ring is rated 5.0 out of 5 by 18. Rated 5 out of 5 by Anonymous from Sparkle, Class This ring sparkles in every light, is of excellent quality and definitely worth the purchase. The compliments never end!